In the most recent ECB interest rate statement, President Mario Draghi announced that the central bank has chosen to keep rates unchanged at 0.75% and hold off on further easing. Even though the decision was widely expected by market participants, they were still caught off guard by the accompanying statement. According to Draghi, the euro’s recent appreciation could dampen inflation. Draghi doesn’t think that strong euro is a problem in itself though. He believes that the currency’s strength merely reflects the market’s confidence towards the new economic policies that the central bank has implemented. Draghi dismissed the speculation that the central bank would engage in a “currency war” to boost growth though lower exchange rates. Draghi said that the ECB is keeping a vigilant eye on economic developments and is willing to act if necessary to make sure things go as planned. This seems to imply that is prepared to make further interest rate cuts if the need arises. With regards to the economic outlook, Draghi said that economic weakness in the euro zone would probably persist throughout the first half 2013 before gradually recovering later on. The euro took a major hit on Draghi’s words. From 1.3578, the euro dropped to fresh 2-week lows at 1.3368. 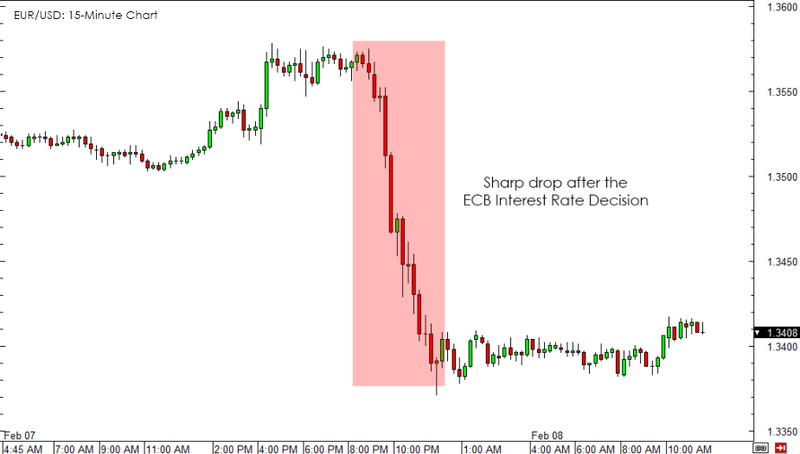 I think it’s pretty clear that the ECB‘s openness to further action was bearish for the euro. Just by using the power of his own voice, Draghi was able to cool the markets and push both bond yields and the euro lower. Despite Draghi’s verbal threats, I do not believe that the ECB will find it necessary to ease further. Generally speaking, the economic situation in the euro area is improving. For instance, euro zone’s manufacturing and services PMIs show that recovery is gathering steam. Even though the PMIs came in below 50.0 (the level that divides growth from contraction), they both beat forecasts and seem to be trending higher. Then there’s the improving job market. December’s labor data showed that joblessness in the euro area has fallen to 11.7% from 11.8%. The market had initially predicted that it would climb to 11.9%. And lastly, banks have already started repaying their LTRO loans. This, to me, is a huge sign that confidence is returning. But of course, this is just my take on the matter. I also would like to know what your opinion on the euro is. Let me know what you think in the comments section below! Where do you think the euro is headed?